LOWELL, Mass. -- Junior goaltender Tyler Wall (Leamington, Ont.) stopped all 28 shots in his ninth victory of the season to backstop the No. 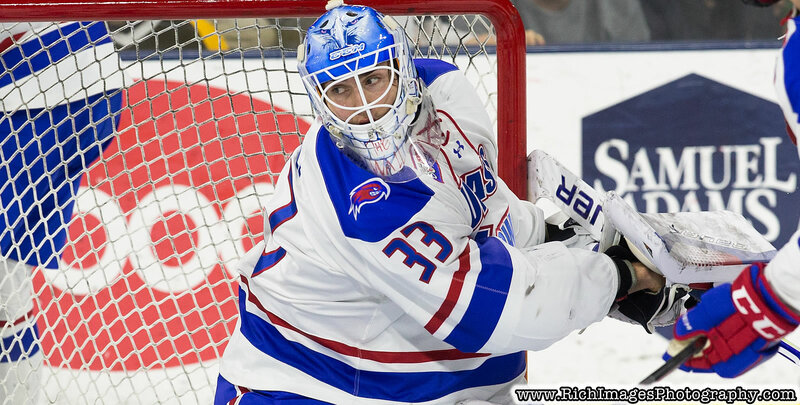 14 UMass Lowell Hockey team to a 3-0 win on Friday night against Boston College in Hockey East play at the Tsongas Center in front of 5,424 fans. The River Hawks improve to 16-8-2 overall (10-4-2 HEA) in the win and move into second place in the Hockey East standings, while Boston College drops to 10-13-3 overall (9-5-3 HEA) after the loss. UMass Lowell extends its unbeaten streak to 8-0-1 in the last nine contests, which is the second longest unbeaten streak in the nation. Junior co-captain Ryan Lohin (Chadds Ford, Pa.) added a power play marker for his 11th of the year to seal the win for the River Hawks at 12:15 of the middle stanza. Senior forward Ryan Dmowski (East Lyme, Conn.) opened the scoring in the game with his 11th tally of the year at 5:47 of the second frame and then junior forward Nick Marin (Springfield, Mass.) added his first of the year just over four minutes later. Wall, who recorded his fourth shutout of the season, totaled 12 saves in the third period, while BC's Joe Woll notched 23 saves in the losing effort for the Eagles. Senior forward Nick Master (Broomall, Pa.) won a game-high 15 of 19 faceoffs (79%) in the victory for the River Hawks. UMass Lowell went 3-for-3 on the penalty kill and was 1-for-4 with the man advantage. Freshman defenseman Chase Blackmun (Hudson, Wis.) totaled two assists on the night. UMass Lowell owned a 14-9 shot advantage in the second period. The River Hawks return to action on Saturday, February 9th for a Kennedy Cup Challenge game against No. 2 ranked Massachusetts. Game time from the Tsongas Center is 7 p.m. The first 1,000 students in the building will receive a "This is Our State" t-shirt.